Is it how you want your slide to look like? Remember slides talk a lot about the person presenting them too. Is this what you want to be remembered for? If your answer is an emphatic “No” or a feeble “Maybe” then…it’s time to be Smart! Unleash the power of SmartArt. Why waste your time creating a graphic from scratch? Saves time when you are designing, especially if you are chasing a deadline and a visual slide seems out of reach for you. Creating graphics from scratch is difficult if you are not very creative with designs. SmartArt solves this problem quickly! 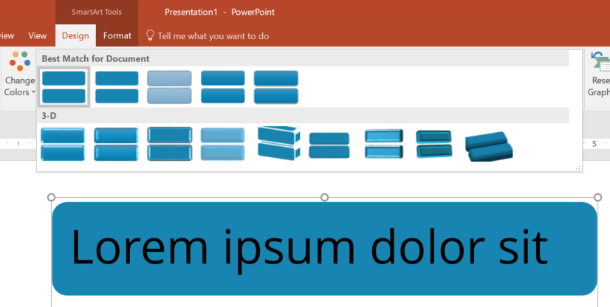 Tweaking SmartArt gives your presentation an original look. Makes your slide stand out. Customized SmartArt - How to design using SmartArt? No need to worry if you don’t have specialized skills to turn your boring presentation into a visually appealing deck. 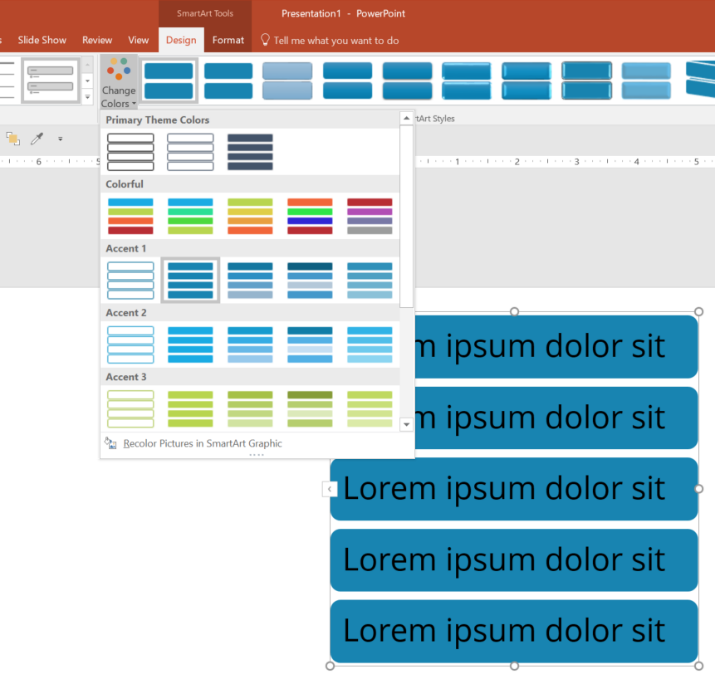 SmartArt is an inbuilt tool in Microsoft PowerPoint, Word and Excel. It provides an instant solution to convert boring numbers/text into graphics. Of course, this doesn’t mean that you overuse the standard diagrams. The audience might think you don’t have anything new to present. Since it is very easy to convert to graphics, you will need to be bold and free to choose different layouts or diagrams and keep experimenting on it. You should also be reviewing the diagrams to see if they convey your message clearly. 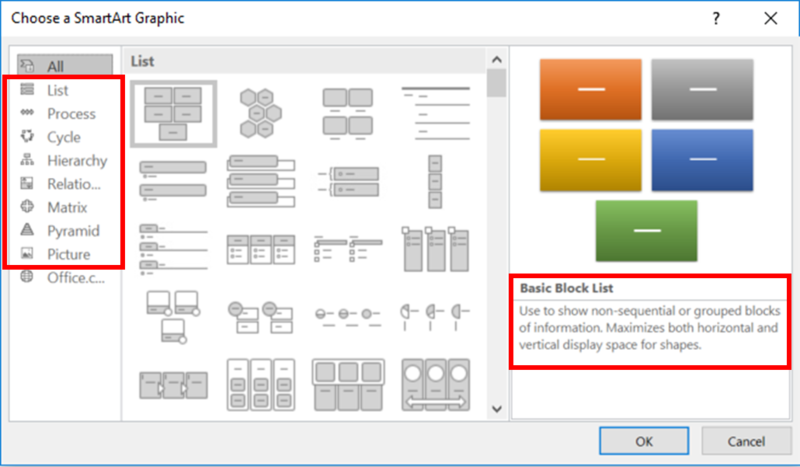 Before you insert the graphics, go through all the available layouts. These are categorized into 8 types and each serving a different purpose. Under each type there are different layouts. Each with a brief description on its uses. This will give you an idea on how and when to use the particular layout. Select the diagram that you need. 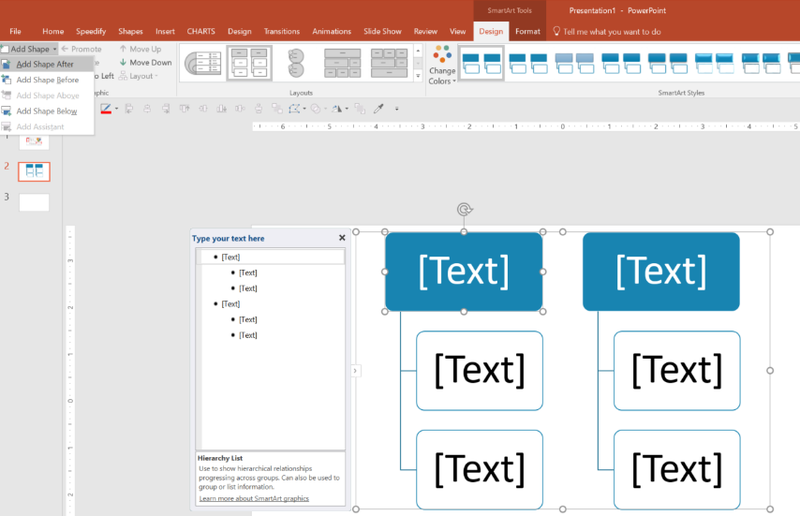 You may add or remove shapes, text, pictures and adjust the structure of the layout. For example, let’s say your slides have boring bullet point lists and you wish to change them into more presentable graphics. 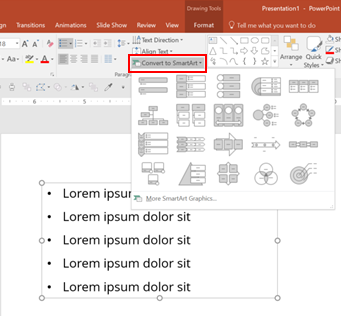 Click on the bulleted list, go to Convert to SmartArt dropdown arrow and point to a graphic type to see its preview on the slide. Choose the graphic type that best fits and suits your content. Simple…isn’t it? In case you want to add more visual touch to it, add pictures to each bullet list. Just follow the same steps and choose Vertical Picture List. Now how do you insert an image? Click on the Picture Icon in the placeholder or you can click on the icon outside. A dialog box will appear to insert the picture and select an image of your choice and insert. Oh and once you are done and happy with the way your diagram has turned out, you may even convert it to editable shapes. 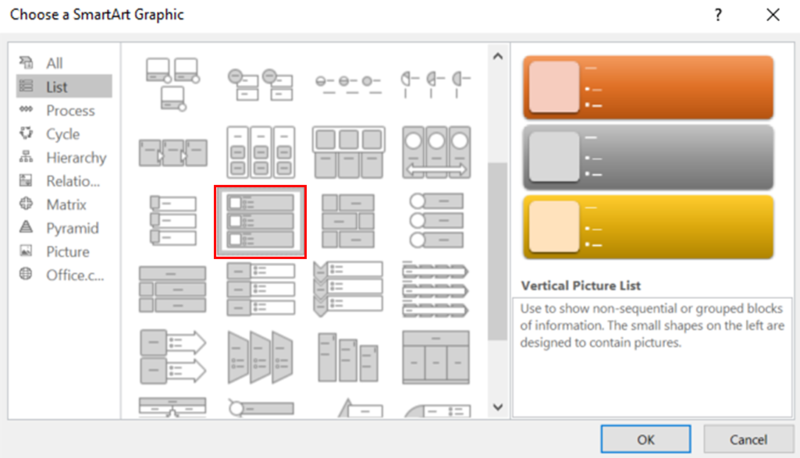 Just select the SmartArt diagram and ungroup it (Ctrl+Shift+G). Voilà! A perfect slide to communicate your work. Feeling confident already, that is the magic you get when you have a perfect deck to accompany your well-prepared speech for any presentation.